This post was originally posted directly on my Facebook page on December 2nd in Japan. Right after the class some of us “Jurassic Ninja ” were invited by Sensei. Noguchi, Pedro, Jack, Sheila, Moti, Gillian, Doug, Christian and a few others. 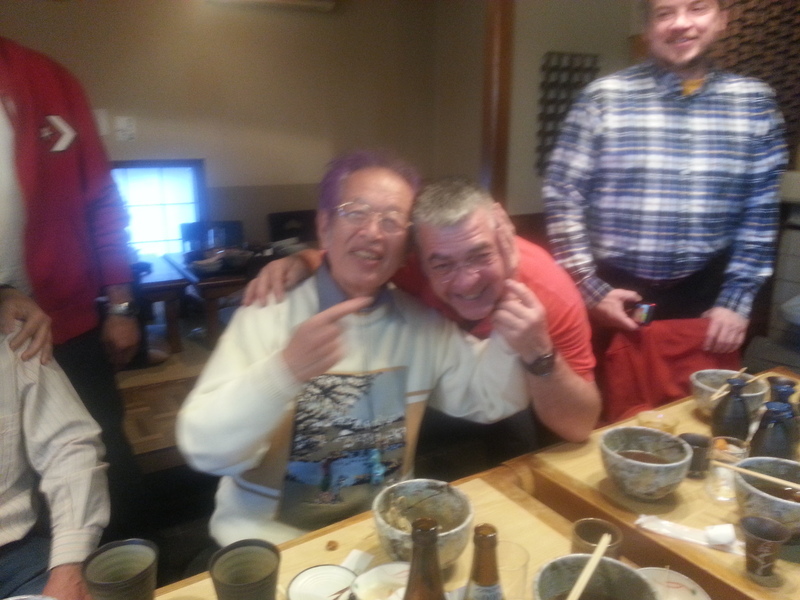 Having lunch with sensei is always fun and the mix of beer, Sake and whisky made it even more memorable. Sensei spoke a lot of the future of the bujinkan. The year 2014 is a new beginning, the beginning of a new 42-year cycle. This is why sensei announced that he will be with us until he reaches 120 years of age. I am sure that Sensei will explain in the next months what he has in mind, so I let him explain it when the time comes. It will mainly concern the new honbu, a new office dealing with the bujinkan paperwork, the time for the jugodan to take responsibility for our organization. But the main subject he unveiled is the necessity to befriend our fellow buyu from all over the world. The bujinkan has been spreading in many countries over the past 42 years and there are no border. Bujinkan is a human art and humans are the same all over the world. Nationalism is not part of the bujinkan, we are all members of the same world. As Sensei said last year: “Bujinkan Budô is made in human”, please don’t forget it. At the end of the lunch we were all very “happy” including our host. On the way back to Kashiwa we stopped at Starbucks for a few coffees and cakes with Pedro, Sheila, Gillian, Christian and many others. And here again there was a lot of happiness. Thank you sensei for this fantastic day and for the depth of your teachings making us more adult and human.